Published February 4, 2015 By Leisa Good This post may contain affiliate links. Regardless, I only recommend sites I've researched and/or used and trust. Ever feel that there just aren’t enough places for a graphic designer to find work? Feel that writers have all the fun with their content mills and freelance sites? Are you constantly on the lookout for sites that might have plenty of design work? Then this article might be of interest to you. One of the hardest things that any freelancer can do is try to consistently find good leads to stay in business. These leads can come from companies or even from private clients. In this article, I will explore companies that offer graphic design. These are sites where both individuals and companies turn to when they need a variety of graphic work done: web design, logos, and graphic art. While there are many, many places that you could go, I will focus on what I believe to be the top five. A favorite of almost everyone that I talk to is 99Designs. There seems to be a variety of work there, and the pay seems to be fair. The only problem is it is highly competitive due to its good reputation. It may not be the best place for a beginner, but you can always try. It mostly operates as a contest for designers to brainstorm ideas for a client. The client will pick the winner and then reward them with the contest money. After the contest, the two can continue working with each other on other projects. This is a very lucrative job board site which has done work for Facebook, Apple, ESPN, and the New York Times. There is a variety of work which also includes jobs for web developers and illustrators. There are regular job-jobs and freelance work too. Not the best place for a beginner, but something you can work towards. Most of the jobs are in the United States. Krop is a great job board site for graphic design work on all skill levels, especially the beginning level. Once you sign up at Krop you will have job board access and also be able to post your work by using the portfolio hosting. Most of the jobs are in the United States and the pay seems to be lucrative. Smashing Jobs is owned by Smashing Magazine, one of the top industry magazines in graphic design. Freelance jobs as well as regular jobs are available on the job board. Smashing Jobs has handled such important clients as Amazon, Mercedes Benz, Sony, and Nokia. This is a job board with over 4 million worldwide users. 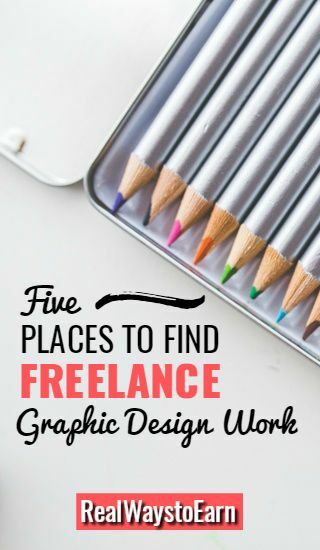 Upwork is a great place for beginners to find graphic design work. It is international and very competitive, but you can set your prices low in the beginning. This is a bidding site and not a contest site or a job board. So, if you are generally comfortable on bidding sites, then you should be okay with this one too. You will need to sign up and create a portfolio. It also wouldn’t hurt to take a few tests to prove yourself. Another excellent resource for this is FlexJobs. Many well-known companies choose to post their listings there each time they have openings, and I have seen graphic design jobs posted. Also, their listings are pre-screened for scams. Additionally, they are often employee positions if you'd prefer to do that rather than work as a freelancer. Another (free) option for searching is Indeed. Like all freelance work, graphic design work can have busy times and slow times. It’s just a matter of being consistent and always being on the lookout for that next great project. Thanks for sharing this helpful post. I am working as freelance web designer ans familiar with oDesk. @Steve Mark – Glad to hear that! Thanks for the list. I needed fresher leads for graphic design work. My only issue is with 99designs. The “contest” angle of the site feels like spec work. Read up on reviews and 99designs policies before submitting your work. I don’t want to say anything bad about them, Some designers find their services helpful when finding work. Just make sure the time is worth the pay. You are welcome, Kim. It’s always good to try fresh leads.